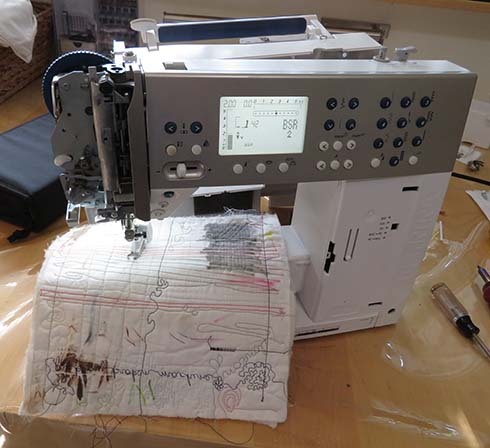 I’m not a Bernina tech or a Bernina anything, but I’m going to put this out there in case someone else has a similar problem. Maybe it’ll help. Your mileage may vary. I have an older but still nice machine, the Bernina 440QE. Last fall, it began freezing. When I sewed, sometimes the machine’s needle would quit moving and the display would go blank. I could reset the machine by turning the power off and on, but the problem would reoccur later. I took off the panel. Yep. I was definitely losing 5V. That sounded like a power supply problem to me, but I was darned if I knew how to fix it. Clearly I needed to find a repair place. I started pawing around on Yelp, reading reviews of local Bernina-authorized repair places. The reviews were discouraging. At one place, customers recounted a snotty attitude from the owner and mandatory $200 cleaning charges simply for walking through the door. Another store was prone to losing equipment and not returning phone calls or emails. At yet another, the owner had a poor reputation, with one customer saying he’d yelled and thrown things at them. None of the places sounded worth my time or money. I wondered whether there was another repair option. 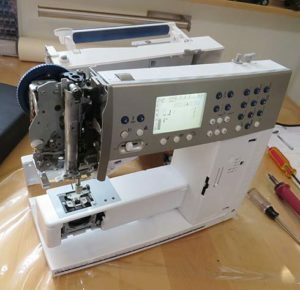 In the meantime, I was able to limp along with my machine in its semi-broken state, simply powering it off and back on when it froze. It was annoying but I could work, just barely. Unfortunately, the amount of time the machine would work grew shorter and shorter by the day. It was clear that some component inside was heating up and getting closer to permanently failing. One day the machine would simply quit working. I needed to have a strategy in place for when that happened, something other than crawling to one of the local dealers. I considered driving to a dealer elsewhere, if I could find one that was reputable, or even pulling out my credit card and ordering a new machine. One day I stumbled across a couple of helpful posts on the Fixya site, here and here. It seemed that I wasn’t the only person who’d experienced this particular problem! The likely culprit was a chip on the power supply board. Unfortunately, if I took my machine to a Bernina repair place – assuming I could find one which didn’t have the ethics of a used car dealer – they’d simply replace the entire L-print board. That would be costly. However, I could simply order a new chip myself, solder it in, and be on my way. Before doing anything, I had a look at the chip’s datasheet, to see whether the component sounded like something which might affect voltages. I invite others to do the same. It had been awhile since I’d done much soldering, so I pulled the covers off the machine. 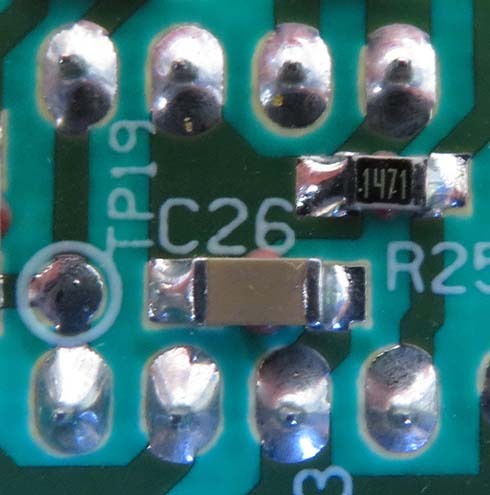 I figured I’d have a look at the board and the chip to see how easy they were to access. Who knew? Maybe I’d be lucky and the power supply board would be covered with ten years worth of dust. That’s the kind of thing that can cause heating and other issues, and is simple to fix. 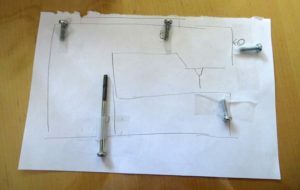 As I removed screws, I made rough sketches of the back and front of the machine and taped the screws in the appropriate locations. I’m sure other people have their own methods for tracking where screws go, but that’s one which has always worked for me. There was some schmutz under the covers, mostly from the machine’s belt wearing down, but not as much as I’d anticipated. Let’s just say that after working at a particle accelerator for years, where equipment was sometimes exposed to challenging conditions, I’ve seen some nasty stuff. Good times. 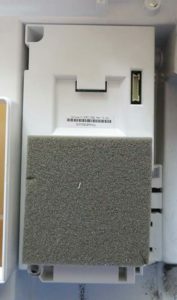 The L-print board with the wayward chip lies beneath this plastic panel. 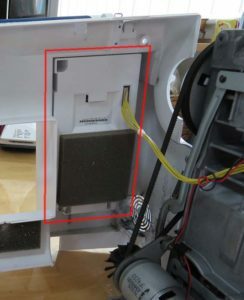 To access it, I had to remove a couple of screws as well as the connector attached to the yellow wire harness. 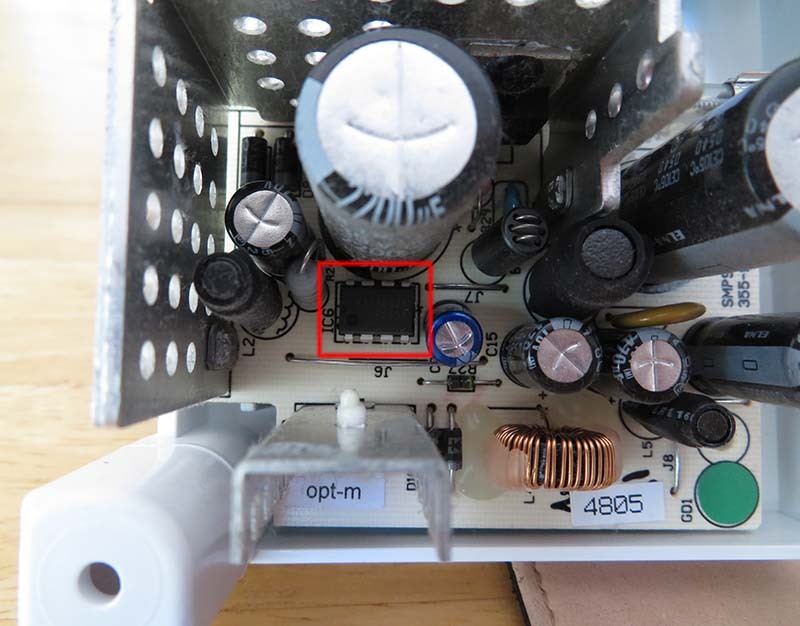 I used a pair of needle nose pliers to gently wiggle the connector free of the board which is hidden beneath the plastic cover. Yes, the yellow wires need to stay attached to the connector. Pulling them out probably WILL land one in a repair shop. Board cover after carefully unplugging the connector. Such fun. At last we get to see the L-print board. We can’t see it in this photo, but the chip the Fixya site claimed might be the problem is hiding behind that large capacitor. There it is, the KA34063. 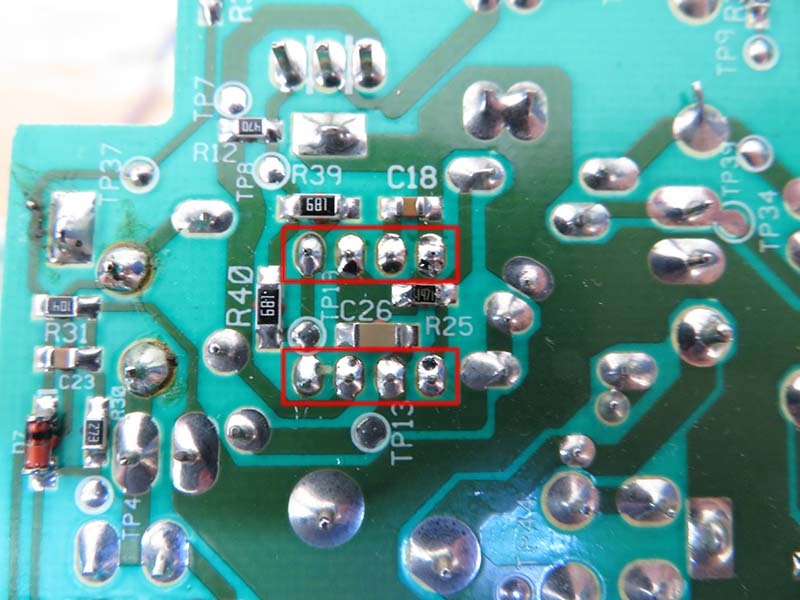 After unscrewing the board from its plastic mount and flipping it over, I was able to see the solder joints for the chip. They’re outlined in red. At that point, I decided it was safe to order a few. And yes, I ordered several in case I wrecked a couple. As the person on the Fixya site said, the KA34063 can be found on eBay. Other places carry them as well. I purchased mine from DigiKey. DigiKey offered USPS first class shipping which, while not as glamorous as FedEx or UPS, got the chips to me rapidly and cheaply. 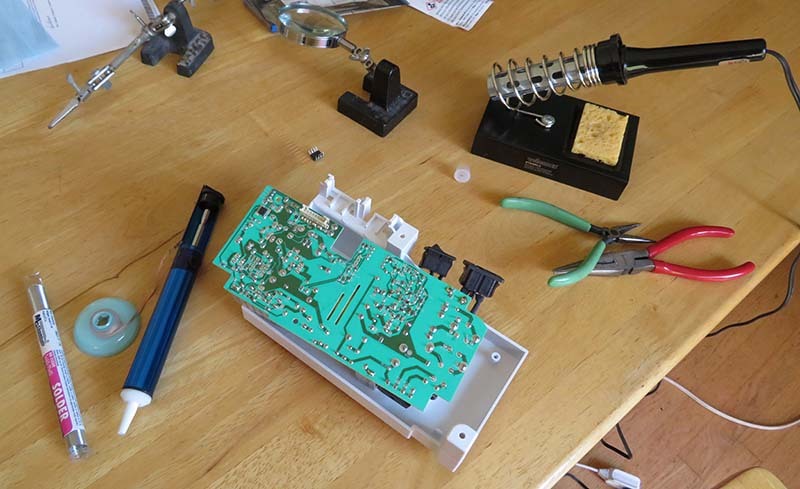 Here I am at the dining room table, ready to take a soldering iron to the sewing machine I paid mumbledy-mumble thousands of dollars for about ten years ago. Sure. Why not. What could possibly go wrong? 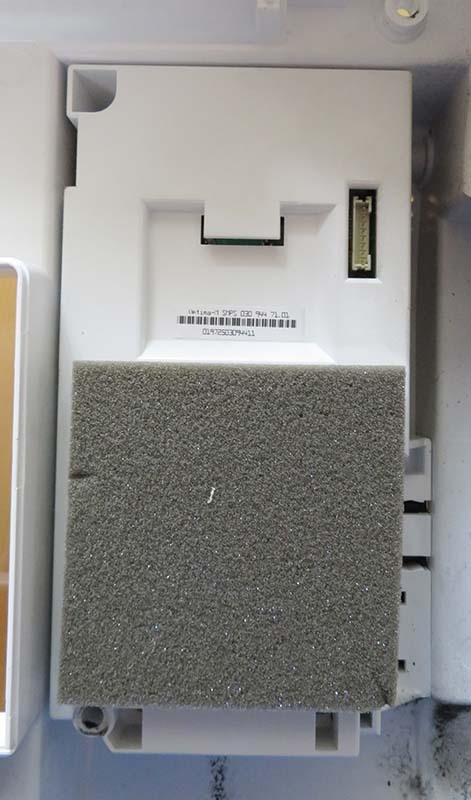 Back of the board before removing the old chip. I like to take a photo so I can check things later like, oh, was that giant burned spot on the board before? Was that component always a melted heap of slag? You know. Little things like that. After removing the chip and soldering in a new one. Eh. My soldering isn’t beautiful, but it’ll do. 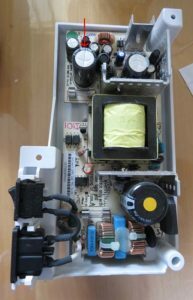 After replacing the chip, I reassembled the machine just enough that I could turn the power on – notice that I don’t have the back cover screwed on. Then I stared at it for five minutes, debating about whether I was about to make a mistake if I flicked the switch. Nope. Things were just fine. No dead panel, no fuses blowing, no electrical smell, no teensy poofs of smoke. Not that there should have been; I was careful. I plugged in the BSR and did a little test to see whether its optical sensor saw fabric moving. Yep. That worked fine, too. I let the machine sit, powered on, for an hour before turning it off and sealing it up. The freeze didn’t reoccur, so I sealed it up and sewed for an hour. At this point, a couple of days later, the repair still appears to be working. I’m cautiously optimistic. This was the first time I’d used a desoldering pump, which I like to call a “solder sucker”. I wish I’d tried one years ago. They’re dirt cheap and incredibly convenient. 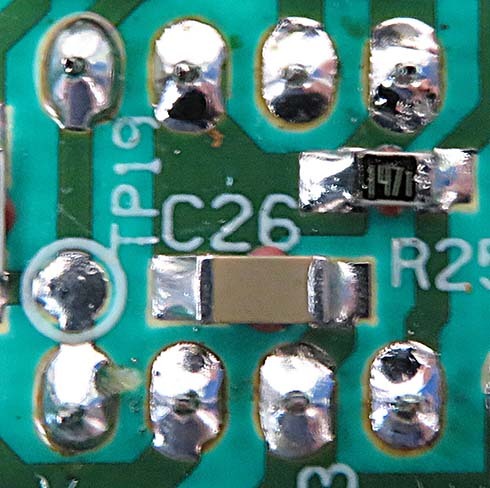 All I had to do was heat the solder holding in my chip, trigger the pump, and the solder was gone. I only had to go over the connections once with the pump then do a little touchup with desoldering wick. The chip came out super easy after that; I wiggled it out with a pair of needle nose pliers from the other side of the board. Hope this helps somebody. This may not be the cause of everyone’s 440QE display freezes, and not everybody is going to feel comfortable tearing into their machine, but at this point I’m well pleased. The machine is purring along, and now that I’ve looked under its covers, I feel like we’re good friends. This entry was posted on Friday, April 27th, 2018 at 2:03 pm	and is filed under Uncategorized. You can follow any responses to this entry through the RSS 2.0 feed. You can leave a response, or trackback from your own site. Tanya, you are a fascinating and complex person, so intelligent and creative that I feel like a Neanderthal reading you. 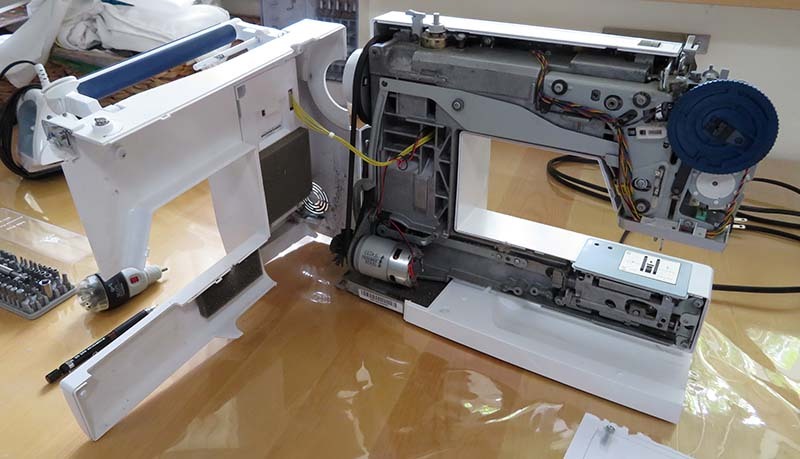 I was gloating over my self-proclaimed freaking genius replacement of the heating element in my oven when I read about your thrilling and brave rescue of your Bernina. I nearly faltered over selecting the right drill driver from the socket set. This all came about after finding your blog (again) when I read on FB somebody’s question about do you read blogs. I’ve submitted a group piece to Houston; will be eager to hear the outcome of your entries.This should be commenting on the next blog, but I’m here now.